Dan Avery of Alcester, S.D., is working on a new model for connecting the growers and producers of specialty grains with the people who want to buy them—helping farmers make more money, and helping consumers more easily find those specialty products. He’s pretty sure there’s a need for this kind of exchange because not too long ago he was on a desperate search for those grains himself. When Avery started Dakota Earth in 1991 he “didn’t know anything. Flour was flour,” he said. What he learned over the next 20 years from customers was that his pasta was better. They told him it provided better taste, better nutrition and better digestion. Avery’s pasta was primarily made with a durum, or hard, wheat that allowed some people with food allergies to enjoy fettuccini once again. It wasn’t until the mill he got his flour from discontinued production that Avery realized what a special thing he’d had. Seemingly overnight, market sales of Dakota Earth flour dropped from 250 bags to 200 to 150 and finally hit fifty. An 80 percent drop in sales was a slap in the face—and an epiphany in which the idea that would become Heritage Grain Exchange was born. In his search for the missing link, Avery joined the Northern Plains Sustainable Ag Society (npsas.org). It was there that he was finally able to put his green thumb upon what he said differentiates awesome pasta from so-so pasta: ancient grains. Farmers have developed the genetics of their crops for millenia, every time they select the best seeds from their harvests. In the past 100 years, that selection has intensified in some crops—especially with the introduction of technology that changes plants more quickly and more dramatically than would likely happen either through natural selection or the actions of farmers. Ancient grains are varieties of grain and cereal crops that have been less selectively bred than the crops that have been the focus of modern breeders, so they are closer to the plants that existed millenia ago. Roughly speaking, ancient grains include Kamut, millet, barley, teff, oats, freekeh, bulgur, sorghum, Farro, spelt, einkorn, emmer (durum), quinoa, amaranth, buckwheat and chia. Dan’s involvement in NPSAS taught him that it is more than just genetic selectivity—it is a process that begins with the right grain, depends upon environmentally friendly agriculture practices and finishes with a deliberate milling system. 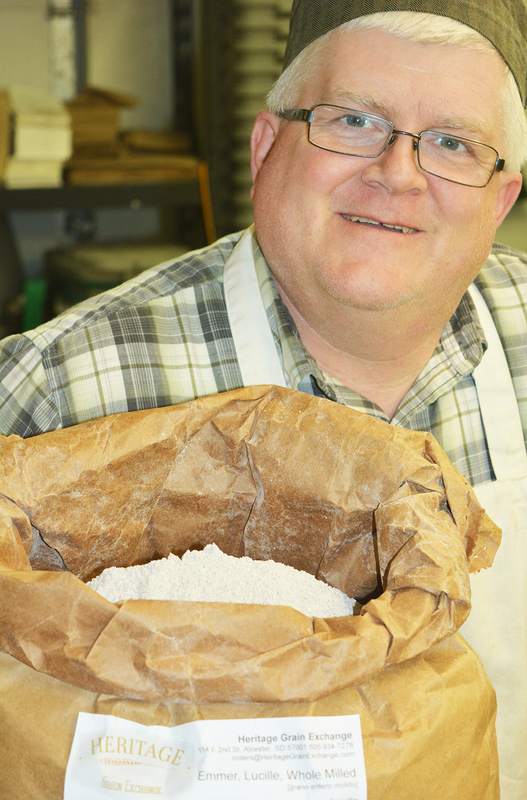 In other words, the secret to Dakota Earth’s customer-preferred Durum flour turned out to be an ancient grain, farmed with ancient practices and milled on an ancient mill. Grains cultivated this way can be differentiated, not unlike how wine grapes have different vintages. The difference between ancient grains and “enriched wheat flour” is the “difference between a Napa Valley Cabernet and Boone’s Farm,” Avery said. He had found the missing ingredient but had no way to scale it for his business. “The (commodities) markets were tanking,” Avery said, “and at the same time, the health food market was exploding. General Mills was buying everything they could get their hands on,” so producers couldn’t afford to sell their ancient grains flour on the white flour market, and the huge companies were buying up everything organic for the multi-billion-dollar gluten-free market. What was needed was a regional farm-to-table cooperative. Enter Heritage Grain Exchange. The Exchange is a regional collaborative effort to bring growers, producers and customers together. Its aim is to circumvent the unwieldy commodities markets and to head off leviathans like General Mills before they turn everything into a Cheerio. The Exchange is not necessarily a literal market. It is a communication forum where producers can advertise supply and consumers can signal demand. It is a place where you can buy a palette or a sack or potentially even a single bun. “We have to get the farmers on board, we have to get the bakers on board, and we have to get the consumers on board,” Avery said. In his voyage of discovery, Avery realized the missing link in the whole exchange process was the milling. “Milling is the key. Like a windmill, stone ground,” Avery said. “Dakota Earth will weld that link” by providing a stone milling process for users of the Heritage Grain Exchange. 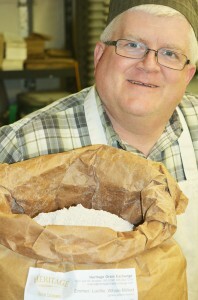 The Heritage Grain Exchange’s mission is to provide a connection between local producers of ancient grains and regional markets—to bring specialty varieties like Clarks Cream Wheat via the Exchange to places like the Prairie Farmer’s Market and the Breadsmith in Sioux Falls, or smaller venues like the Arlington Market. Avery’s grander vision is to bring specialty grains to tables all over the country. “I want people to say, ‘Oh, that flour was milled from grains grown in the Great Plains of South Dakota and North Dakota,’” he said.